Water, soybean oil,vinegar, sugar, dried minced onion & garlic, salt, dried red bell peppers, natural flavour, xanthan gum, spice, propylene glycol alginate, sorbic acid, yeast extract, concentrated lemon juice, calcium disodium edta. Combining garlic, herb, and acid notes with a hint of sweetness, Hellmann's Classics Italian Salad Dressing makes a versatile addition to any commercial kitchen. This gluten-free Italian dressing is made with real, simple ingredients that your guests can trust, and it contains no high fructose corn syrup or artificial colours or flavours. With a lightly emulsified vinaigrette texture, the dressing has a premium mouth feel. Certain to please even your most discerning patrons, this dressing works beautifully when drizzled over delicate greens or used as an ingredient in a marinade. 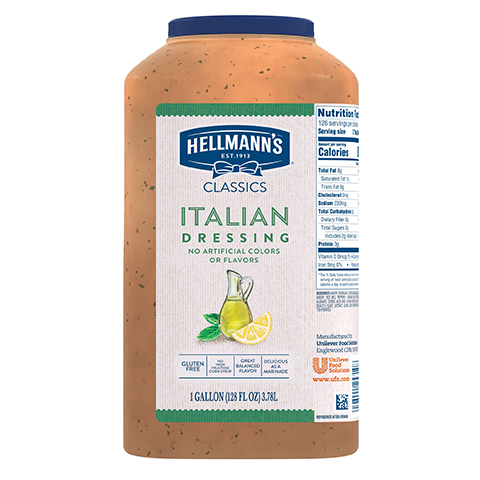 Being non separating, Hellmann's Italian Salad Dressing clings to the top of salads. Ideal for marinating vegetables for the salad bar. Does not have to be refrigerated until opened and packaged in jug with convenient handle. For crispy salad bar salads, use Hellmann's Italian Salad Dressing and mix with fresh beans (yellow or green) and thinly sliced Spanish onion.